Whole-body imaging plays a crucial role in the diagnosis and follow-up of pediatric malignancies, as tumor spread may involve different anatomical regions. 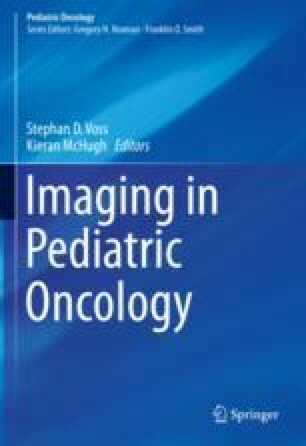 Until recently, ultrasonography (US) and computed tomography (CT) have been the imaging technique of choice in children with cancer, but nowadays there is an increasing interest in the use of functional imaging techniques like single-photon emission computed tomography (SPECT) and positron emission tomography (PET). By combining these latter techniques with CT, it becomes possible to simultaneously acquire imaging data on the biological behavior of tumor as well as the anatomical localization and extent of tumor spread. Because of the small but not negligible risk of radiation-induced secondary cancers and the significantly improved overall survival rates of children with cancer, there is an increasing interest in the use of radiation-free imaging techniques such as magnetic resonance imaging (MRI). MRI allows for acquiring images with a high spatial resolution and excellent soft tissue contrast throughout the body. Moreover, recent technological advances have resulted in fast diagnostic sequences for whole-body MR imaging, including functional techniques such as diffusion-weighted imaging (DWI). In this chapter, the current status of the technique, major clinical applications, and future perspectives of whole-body MRI in children with cancer will be discussed. Van Engelen K, Villani A, Wasserman JD, Aronoff L, Greer MC, Tijerin Bueno M, et al. DICER1 syndrome: approach to testing and management at a large pediatric tertiary care center. Pediatr Blood Cancer. 2018;65(1) https://doi.org/10.1002/pbc.26720.